Fiddleheads are young, edible, fern shoots that are harvested when they are still curled. They are very similar in shape to the head of a violin, hence their name. These woodland plants are gathered for about four to six weeks, weather permitting, in the spring when they are still tightly curled and cut off the fern between 4 and 6 inches high from the ground. Fidddlehead ferns are used in North American, French and Asian cooking. 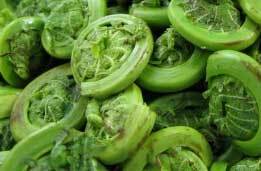 North American fresh Fiddleheads are only available in the spring. Fiddlehead ferns should be a rich green, firm and tightly curled. The stems should be short and the heads measure between .75 and 1.5 inches in diameter. Fiddleheads are perishable and should be refrigerated as soon as possible to prevent them from uncurling in the process. Wrap them in plastic bag and refrigerate for up to 3 days. 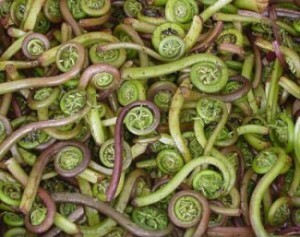 Fiddleheads should be washed twice and cooked before eating. Before cooking remove the yellow/brown skin, then boil the ferns twice with a change of water and a rinse between boilings. Changing the water reduces the bitterness and lessens the concentration of tannins and toxins. Fiddlehead cooking time is ten minutes if boiled and twenty if steamed. The cooking method recommended by gourmets is to spread a thin layer in a steam basket and steam lightly, just until tender crisp. Serve hot doused with Hollandaise sauce, lemon and butter, or chilled in a salad. Cooked Fiddleheads can be frozen.